Unless something extraordinarily exciting happens, there will be no Zeta Minor updates this week. This page will next be updated on New Year's Eve. Zeta Minor would like to extend a very merry Christmas to all visitors! 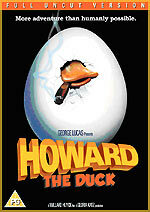 Metrodome has announced that they will release the infamous George Lucas-produced 1986 turkey Howard The Duck on February the 18th. Despite the critical pasting it received upon its theatrical release, the film has, over time, garnered something of a cult following. It's release will, no doubt, also please fans of John Barry's perky score, which, inexplicably, has never received a legitimate CD release. Metrodome's "full uncut version" DVD will feature an original theatrical trailer, but is otherwise bereft of bonus features. No technical details were released. The full press release can be found in the disc's Incoming record. Metrodome titles due on January the 26th schedule include Ray Liotta drama Comeback Season; Bernard Rose's World War II crime thriller Chicago Joe and the Showgirl; and two Alan Alda movies: the starry comedy Sweet Liberty; and Golden Globe-nominated drama Four Seasons. None of these discs will have any bonus features. RRP for all the discs is £12.99. I have the second in our series of interviews with Heroes cast and crew members for you today (a little later than anticipated, sorry!) This time it's with Adrian Pasdar, who plays Nathan Petrelli. You can find our Heroes interviews indexed here. Another couple of interviews soon! Heroes Season 1 is now available on DVD and HD-DVD! Many new titles have been added to the Incoming database this week, including the recent BBC costume drama Fanny Hill; new Network titles, including the fourth volume of The Bill, a box set of early Hitchcock movies, Alfred Hitchcock - The British Years, and the 1978 adaptation of Kidnapped. Additional details have been added for other titles, including Disney's The Aristocats, and two new Eureka's Masters of Cinema releases: Rocco and His Brothers and a double-bill of Chikamatsu Monogatari and Uwasa no Onna.